Scott Sumner has replied to my previous post in which I argued that the Federal Reserve de facto has implemented a 4% NGDP level targeting regime (without directly articulating it). Actually I would have been very upset, as indeed I was as soon as I saw what they were doing. I favored a policy of level targeting, which meant returning to the previous trend line. Now of course if they had adopted a permanent policy of 4% NGDP targeting, I would have had the satisfaction of knowing that while the policy was inappropriate at the moment, in the long run it would be optimal. Alas, they did not do that. The recent 4% growth in NGDP is not the result of a credible policy regime, and hence won’t be maintained when there is a shock to the economy. We have had five years of supply side adjustments – five years of “internal devaluation”/”wage moderation” so to speak. It is correct that the Fed didn’t boost aggregate demand sufficiently to push down US unemployment to pre-crisis levels, but instead it has at least kept nominal spending growth very stable (despite numerous shocks – see below), which has allowed for the adjustment to take place on the supply side of the economy and US unemployment is now nearly back at pre-crisis levels (yes employment is much lower, but we don’t know to what extent that is permanent/structural or not). Furthermore, we have had numerous changes to supply side policies in the US – mostly negative such as Obamacare and an increase in US minimum wages, but also some positive such as the general general reduction in defense spending and steps towards ending the “War on Drugs”. Given these supply side factors – both the adjustments and the policy changes – it would make very little sense in my view to try to bring the NGDP level back to the pre-2008 trend-level and I don’t think Scott is advocating this even though his comments could leave that impression. Furthermore, given that expectations seem to have fully adjusted to a 4% NGDP level-path there would be little to gain from targeting a higher NGDP growth rate (for example 5%). Furthermore, I would dispute Scott’s claim that the Fed’s policy is not credible. Or rather while the monetary policy regime is not well-articulated by the Fed it is nonetheless pretty well-understood by the markets and basically also by the Fed itself (even though that from time to time could be questioned). Hence, both the markets and the Fed fully understand today that there effectively is no liquidity trap. There might be a Zero Lower Bound on interest rates but if needed the Fed can ease monetary policy through quantitative easing. This is clearly well-understood by the Fed system today and the markets fully well knows that if a new shock to for example money-velocity where to hit the US economy then the Fed would most likely once again step up QE. This is contrary to the situation prior to 2008 where the Fed certainly had not articulated a policy of how to conduct monetary policy at the Zero Lower Bound and this of course was a key reason why the monetary policy stance became so insanely tight in 2008. This does in no way mean that monetary policy in the US is perfect. It is certainly not – just that it is no less credible than monetary policy was during the Greenspan years and that the Fed today is better prepared to conduct monetary policy at the ZLB than prior to 2008. If we look at the development in nominal GDP it has actually been considerably more stable – and therefore also more predictable – than during the Great Moderation. The graph below illustrates that. It is particularly notable in the graph that the NGDP gap – the percentage difference between the actual NGDP level and the NGDP trend – has been considerably smaller in the period from July 2009 and until today than during the Great Moderation (here said to be from 1995 until 2007). 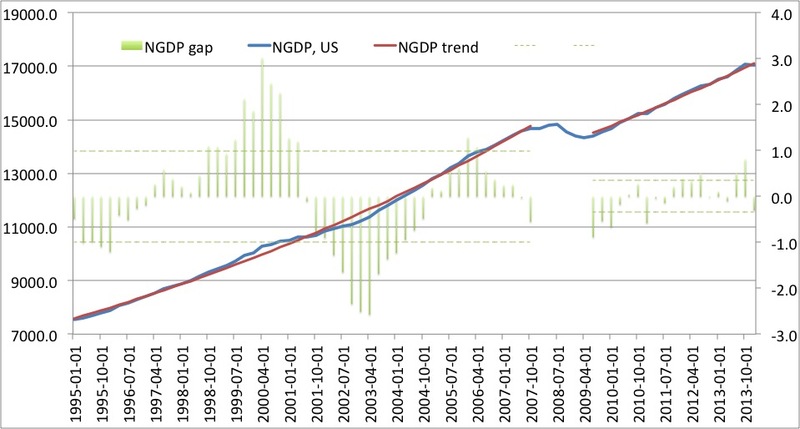 In fact the average absolute NGDP gap (the green dotted lines) was nearly three times as large during the Great Moderation than it has been since July 2009. Similarly inflation expectations has been more stable since July 2009 than during the Great Moderation and there unlike in the euro zone there are no signs that inflation expectations have become unanchored. It is easy to be critical about the Fed’s conduct of monetary policy in recent years, but I find it very hard to argue that monetary policy has been worse than during the Great Moderation. 2008-9 was the catastrophic period, but since 2009/10 the Fed has re-established a considerable level of nominal stability and the Fed should be given some credit for that. In this regard it is also notable that financial market volatility in the US today is at a historical low point – lower than during most of the Great Moderation period. This I believe to a large extent reflects a considerable level of “nominal predictability”. It is obviously correct that the Fed has failed to spell out that it is actually targeting a 4% NGDP level path and I agree with Scott that this is a major problem and that means that the US economy is much more sensitive to shocks than otherwise would be the case. However, I would also stress that first of all during the Great Moderation the Fed had an even less clear target officially than is the case today. Second, we should not forget that we have actually seen considerable shocks to the global and to the US economy since 2009/10. Just think of the massive euro crisis, Greece’s de facto default, the Cyprus crisis, the “fiscal cliff” in the US, a spike in oil prices 2010-12 and lately a sharp rise in global geopolitical tensions. Despite of all these shocks US NGDP has stayed close to the 4% NGDP path started in July 2009. This to me is a confirmation that the Fed has been able to re-establish a considerable level of nominal stability. It has not been according to Market Monetarist game plan, but it is hard to be critical about the outcome. In regard to the so-called “fiscal cliff” – the considerable tightening of fiscal policy in 2013 – it is notable that Scott has forcefully and correctly in my view argued that it had no negative impact on total aggregate nominal demand exactly because of monetary policy – or rather the monetary policy regime – offset the fiscal shock. This is of course the so-called Sumner critique. For the Sumner critique to hold it is necessary that the monetary policy regime is well-understood by the markets and that the regime is credible. Hence, when Scott argues that 2013 confirmed the Sumner critique then he is indirectly saying that the monetary policy regime was credible in 2013. Had the monetary policy regime not been credible then the fiscal tightening likely would have led to a sharp slowdown in US growth. … I must admit that I increasingly think – and most of my Market Monetarist blogging friends will likely disagree – that the need for a Rooseveltian style monetary positive shock to the US economy is fairly small as expectations now generally have adjusted to long-term NGDP growth rates around 4-5%. So while additional monetary stimulus very likely would “work” and might even be warranted I have much bigger concerns than the lack of additional monetary “stimulus”. This remains my view. Learn from the mistakes of the past, but lets get on with life and lets instead focus fully on get the Fed’s target well-defined. PS I hate being this positive about the Federal Reserve. In fact I am really not that positive. I just argue that the Fed is no worse today than during the Great Moderation. I’d prefer the Fed try and hit 6% NGDP growth for 2015, and then transition to a 4% or 5% level target, but I more or less agree with the bygones argument. That said, I don’t think it’s clear that the Fed is level targeting, or at least that they’d continue to in an adverse environment. Imagine there’s a power struggle in Saudi Arabia when King Abdullah (aged 90something) dies. Oil supplies seriously disrupted. Spain or Italy default when the ECB tightens the screws. Dollar demand shifts hard to the right while supply side inflation takes off. I can’t imagine the Yellen Fed keeping NGDP plodding along at 4% under this not-so-far-fetched scenario. Most likely they’d give us mild recession and then fail to make up for the new NGDP gap. A 2008-style recession is unlikely, but U.S. monetary policy is still on a loose commodity peg. I guess I trust the Fed to offset haven demand for the dollar or fiscal policy, but could they live with 5% inflation if that were the cost of 4% NGDP growth? I very much agree with you. The Fed is not fully committed to NGDP targeting – in much the same way as it was not committed to NGDP targeting during the Great Moderation. As a consequence a major negative supply shock in the form of sharply higher oil prices would likely cause the Fed to send the US economy into recession. For that exact reason it is important that the Fed officially sets a NGDP level target. By the way I would actually equally fear that the Fed will ease monetary conditions too much in the coming years as the supply side picture for the US is pretty positive and as a consequence we might see inflation at 0-1% while we would see RGDP growth at 3-4%, but there is a risk that the Fed would allow NGDP growth to accelerate too much for too long if inflation for long stays below 2% due to positive supply factors. I don’t worry a lot about that now, but it is likely to become an bigger risk in 3-5 years. “Monetary policy is no worse than during The Great Moderation”, and how did that end? At least the LOLR is more on the case of the banks than during that period, recognising the value of that guarantee and now charging nearer a market rate – well at least requiring much more real capital and being much more aware of all the (previously) hidden leverage. Marcus, the question is for how long we should go back? Should we go back to the “old” NGDP trend after five years of supply side adjustments? I have a hard time thinking that that would be the “right” policy we cannot ignore the supply side adjustments – we could do that 3 or 4 years ago, but not today. Certainly the original level is annatainable today, but there must be an attainable “half-way” level. As it is the economy remains in a DEPRESSION! 1. Has Fed policy been poor over the past 5 years? Yes, way too tight. 2. Is the Fed policy today appropriate? Perhaps, that’s debatable. 3. Does the Fed have a policy regime of level targeting that will avoid mistakes like 2008-09? I see no evidence of that. Yes QE is a plus, but the Fed articulated a desire to do QE if needed even as far back as 2003. It was always in their toolbox. But QE isn’t enough, they also need level targeting, and they don’t have it yet. 1) Yes I agree Fed policy has been too tight. It should certainly have been much easier, but a “credible” quasi-rule has nonetheless been establish. 2 and 3) This rule – probably the Evans rule or a quasi 4% NGDP target – is seriously reducing the risk of a repeat of 2008-9. BUT I am not arguing that the Fed should not introduce a official NGDP level target. Certainly not. All I am arguing is that policy is not worse than what we had during the Great Moderation. The important thing today is not more monetary “stimulus” and there is not reason to try to do a “one-off” lift in NGDP. Focus should fully be on formulating a rule and since we can argue that the Fed has kept NGDP on a “straight 4% line” since July 2009 why not make this the official NGDP level target? It would be hard for the Fed to argue against that. Surely one could be upset in 2009 – as both Scott and I were – that the Fed did not do anything to bring back the nominal GDP level back to the pre-crisis trend and it would likely also at that time have been a better policy to return to a 5% trend rather than a 4% trend. In fact I am pretty sure that if somebody had told Scott in July 2009 that from now on the Fed will follow a 4% NGDP target starting *at the then level of NGDP* then Scott would have applauded it. As you now say above, in 2009 there was still plenty to gain via a much higher NGDP growth rate than 4-5% to move the nominal path back toward previous trend, before prices and supply had time to adjust. You are right. I might have expressed it in an imprecise way. Fundamentally it is about a trade-off between getting a the right rule – NGDP level targeting – or getting monetary stimulus. Imagine that we in have been told to choose between the following two options. 1) One-off monetary stimulus to lift the NGDP level to the pre-crisis trend, but then thereafter the Fed goes back to its old discretionary ways. Or 2) We get no initial “stimulus”, but we get a clearly defined 4% NGDP level targeting regime Sumner style. What would Scott have chosen? I am not sure, but I would certainly have picked clear rule with not one-off stimulus. This by the way is a disagreement Scott and I have had before in different forms. Sometimes Scott in his frustration over the Fed has sound like “stimulus” was more important to him than the introduction of rules. I have on the contrary stress that the important thing is rules rather than stimulus. Haven’t NGDP growth expectations been falling to 3.0% or perhaps even less? Isn’t that a problem for Lars’s argument? As Scott has so often argued – we need a NGDP future! But overall I don’t think that we can argue that NGDP growth expectations have eased – yes, long-term yields have dropped back a bit, but the US stock market continues its bull run and and most hard macroeconomic data in the US has been quite strong recently. So in fact I would actually expect that we are likely to see NGDP growth top 4% and even reach 5% over the coming year. But the important point again is 1) The Fed needs to official acknowledge that it is targeting a 4% NGDP path level. 2) It needs to communicate that it is targeting expectations and announce what measure of expectation it uses in policy implementation. 3) It should be clear that its instrument is the money base. We are certainly not there, but my pragmatic argument is that given the fact that we have been on a straight 4% NGDP line since July 2009 why not make this official policy? That is much more likely to success than to argue in terms of the need for “monetary stimulus” (a need I don’t think is there). I think it is important to differentiate between the one-year outlook for NGDP and the longer term outlook. What Scott has been arguing is that long-term yields are relatively long and that that is indicating low NGDP growth over the longer run. I on the other hand is less worried. First of all, long-term inflation expectations are around 2.5% in the US. Second, I am much less worried about the long-term growth outlook for the US. I have no problem seeing 2-3% potential real GDP over the coming decade. Scott is much more negative. I’m not sure I understand why your forecast for U.S. real GDP growth is so optimistic. See the reasoning below for Sumner’s 1.2% forecast. Isn’t he too optimistic, if anything? “Danny, about 0.2% labor force growth and about 0.5% productivity growth. They add another 0.5% in case I underestimated one of the two.